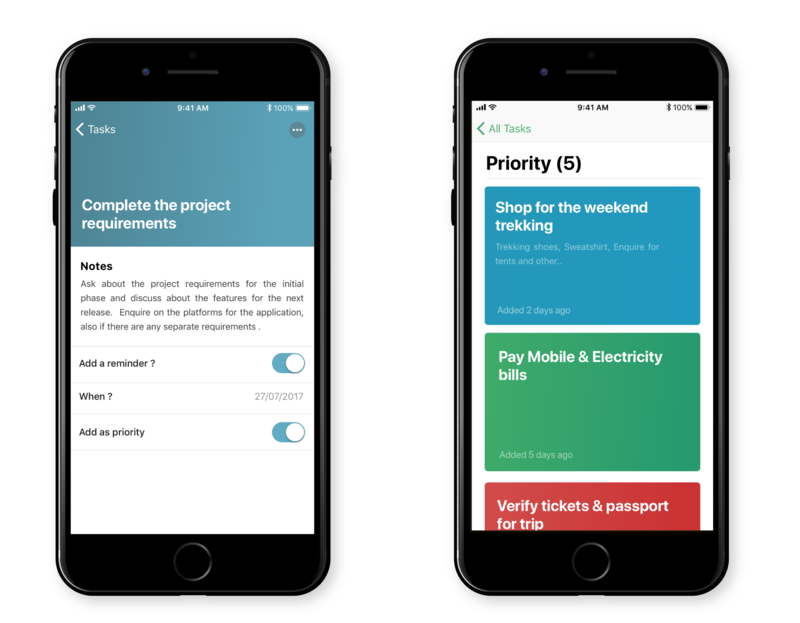 Prioritize is an iOS application to organize and manage your daily tasks and to do’s in an easy way by prioritizing and seggregating the tasks you want into priorities. The application is based on the new iOS 11 Human Interface Guidelines. It also helps user keep track of all their To-do's and day to day task with an optional reminder. The application was primarily designed to have an simple and easy navigation with the concept of complex reduction. 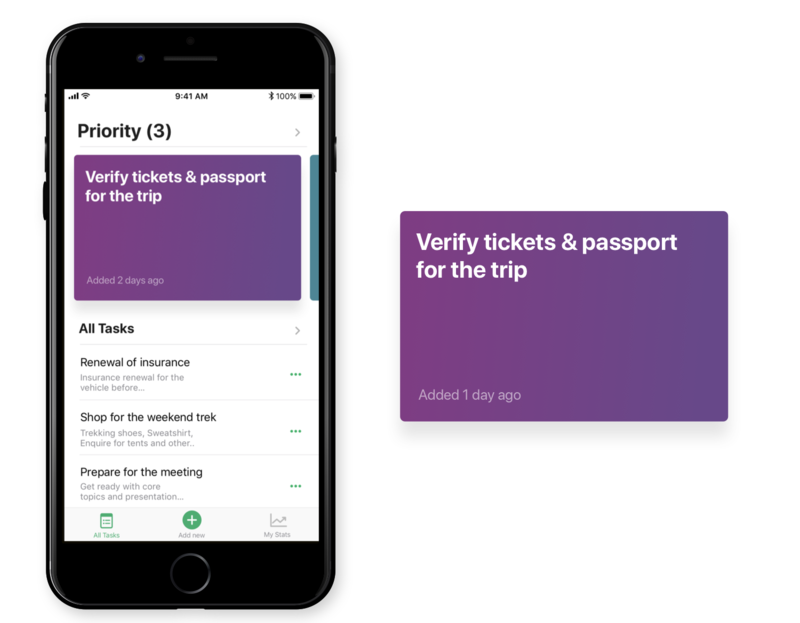 The primary goal of the application was to help users to differentiate between their primary tasks and normal tasks and to-do’s. 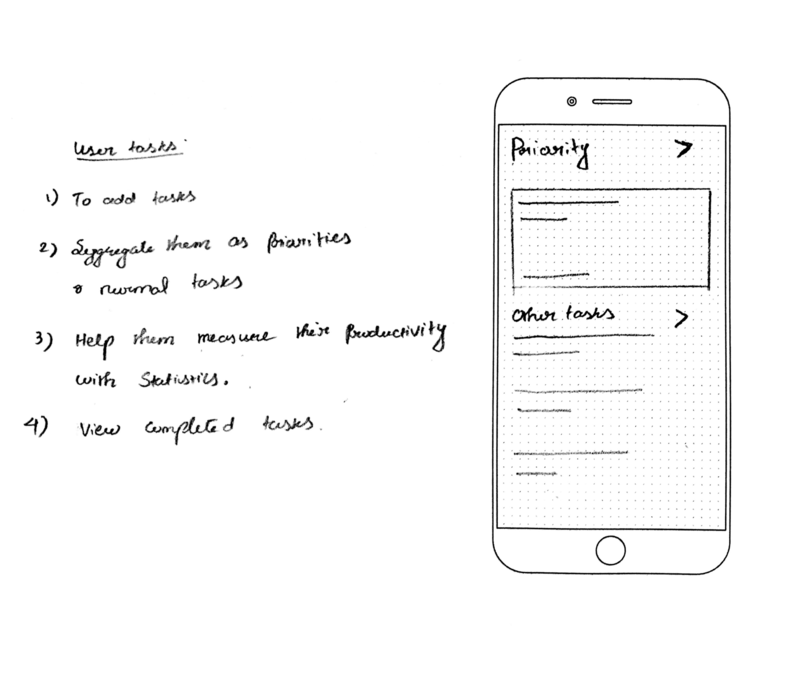 Through initial brainstorming i figured out a way in which the user can view their priorities as soon as they launch the app following the normal tasks. As the result of ideation, cards were used to differentiate between normal tasks and priorities. 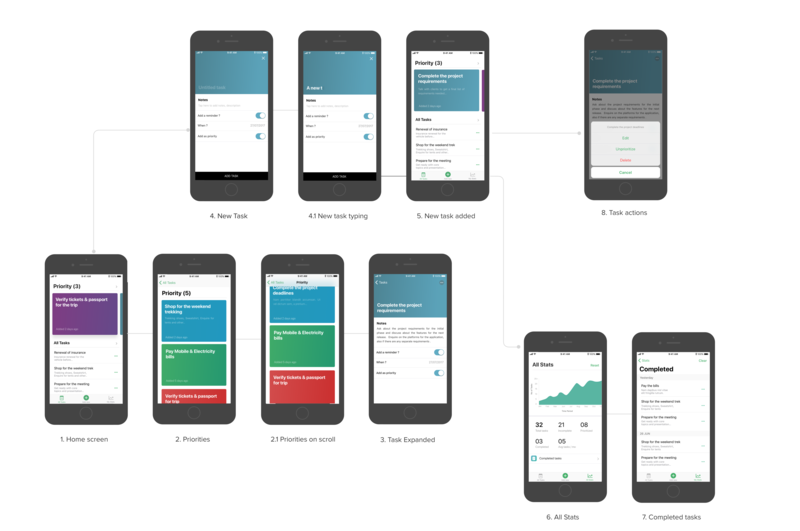 The application was primarily adapted based on the the newly introduced iOS 11 Human interface guidelines. Also, the applications bolsters the trend of complex reduction with a minimal set of colours to help users to focus on their tasks and for a comfortable readability. 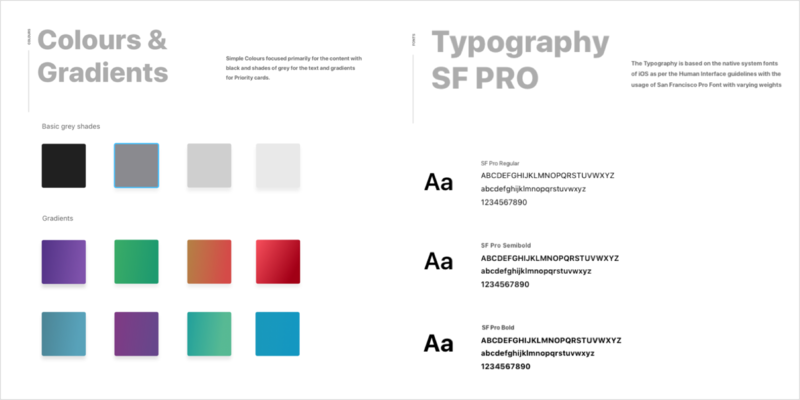 A simple style guide encompassed a simple font guide and the gradients used for the priority cards across the application. The font style was native to iOS using San Francisco Pro text and Pro Display which accommodates to the native components. The gradient shades were made vibrant to stand out for the priority cards. The primary screen which consists of all the tasks listed and where the tasks gets into priorities and normal tasks. The priorities are separated as vibrant cards which attracts the user towards the priorities helping users to concentrate more on the tasks he has segregted as priorities. The tab bar also boasts icons to add a new task and the my stats tab helps the user to keep track of his completed tasks and its statistics. 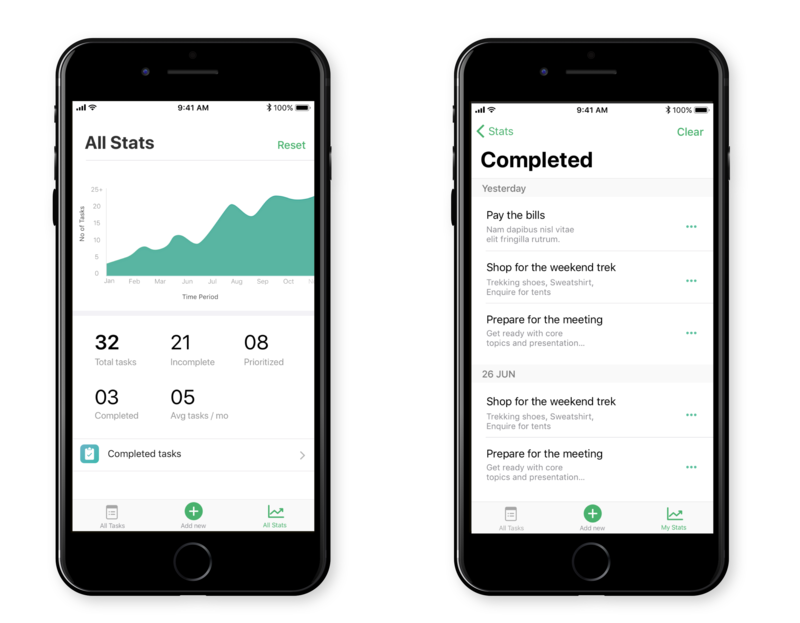 The stats tab helps you track your productivity through the individual stats of each entity and also a graph showing your monthly progress on using the app. The tab also let users view their completed tasks over the period of time they have used the application. The priorities screen is navigated from the home screen to view a list of priorites and to reorder them according to the user’s needs. The cards are rearranged by just dragging and reordering them. The edit screen lets you tasks and its fields (i.e) notes, type of task etc.